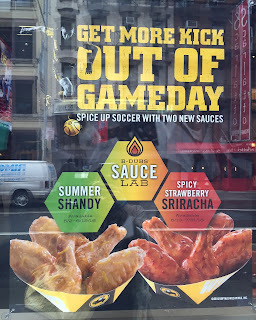 I noticed that Buffalo Wild Wings just had launched a new limited time sauce called "Summer Shandy" on May 2, 2016, and today, we went to Times Square location for lunch. Summer Shandy: Made with Leinenkugel's Summer Shandy, this sauce hits you with a powerful lemon punch that complements its malty flavor. When I read this, I didn't think I'd like it because I rarely drink and I haven't come to the point to think beer tastes good even in hot summer though my parents or friends had explained and experienced. 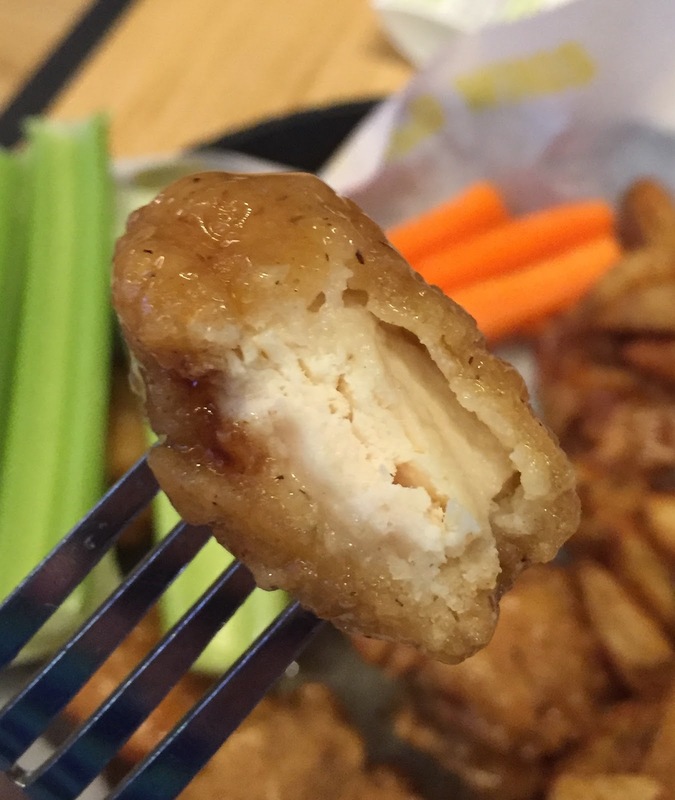 But I just ordered "Snack Size Boneless" from lunch menu with Summer Shandy sauce with "Potato Wedge" for the side, then added celery and carrots. 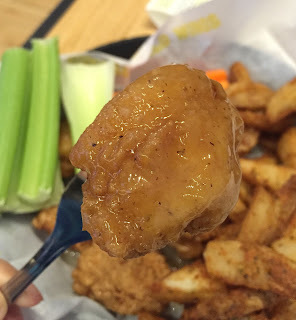 This sauce was very shiny and sticky like honey or maple syrup. It really had some beer and alcoholic flavor with sourness like lemon, but also the sauce was syrupy and starchy. It didn't have appetizing aroma before I even ate it, and I didn't like the sweet, sugary, but weirdly malty flavor at all. Summer Shandy has refreshing natural lemonade flavor that is perfect for summer, according to their HP. As a non-beer drinker, it's hard to compare the flavor but hope the beer tastes better than this awful sauce. On June 13, they'll bring Spicy Strawberry Sriracha and I hope it'd be a good one. 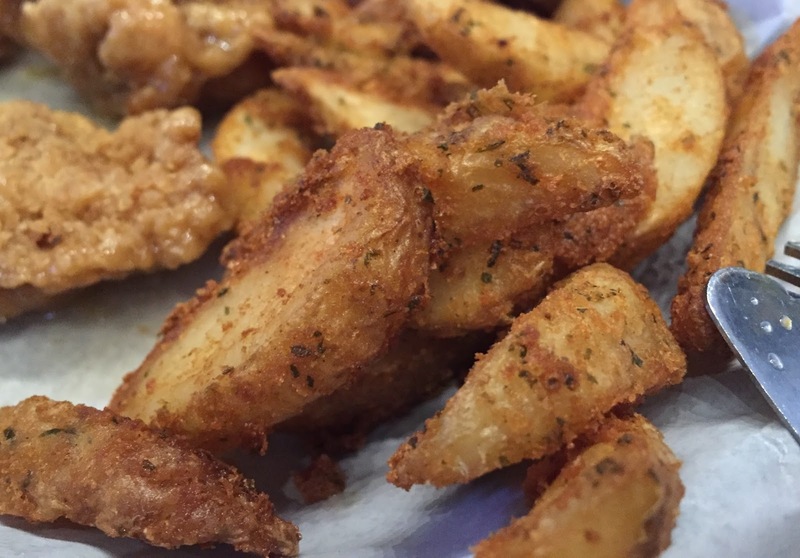 The wedges had some crunchy bits and they looked like panko bread crumbs. They added crunches to the classic wedges and I enjoyed the contrast of the textures. On the window, they had a poster of the sauce. Though the image had lemon peels on, the actual product wasn't garnished with them. 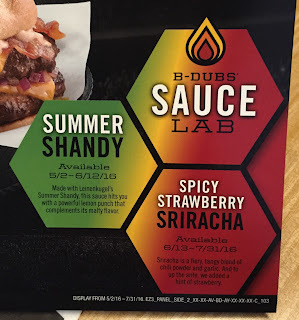 The strawberry sriracha caught my eyes instantly! I can't wait to try that sauce!